Not content with sparring with deceased senator John McCain, forgetting Puerto Rico is part of the United States, or tilting at “cancer-causing” windmills, President Trump has set his sights on a new target: former First Lady Barbara Bush. Wife of the 41st President, George H. W. Bush, and mother of the 43rd President, George W. Bush, she passed away in April of last year, but, like his feud with McCain, Donald Trump doesn’t let a little thing like death stand in the way of his personal attacks. 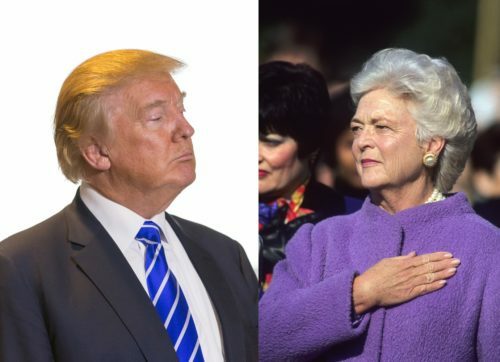 Speaking to the Washington Times, President Trump acknowledged Barbara Bush’s feelings towards him, but added in his own personal dig at the woman. Trump is reacting to quotes from a forthcoming autobiography The Matriarch: Barbara Bush and the Making of an American Dynasty by Susan Page. “After Trump’s rise, she saw it as a party she could not continue to support, a party she no longer recognized — even as one of her grandsons, George P. Bush, was on the ballot as a Republican running for re-election as Texas land commissioner,” writes Page in an excerpt published in USA Today. She also blamed Trump for a heart issue she faced during the 2016 campaign, as her son, Jeb, failed to stop the president during the primary, and referred to the president as, “a symbol of greed” in the forthcoming book. Barbara Bush was an outspoken First Lady, working on literacy and homeless issues. She was also a rare pro-abortion voice in the Republican party.